Sorry for the poor photo quality, but I took this on my phone on an early-morning jaunt a couple weeks ago. 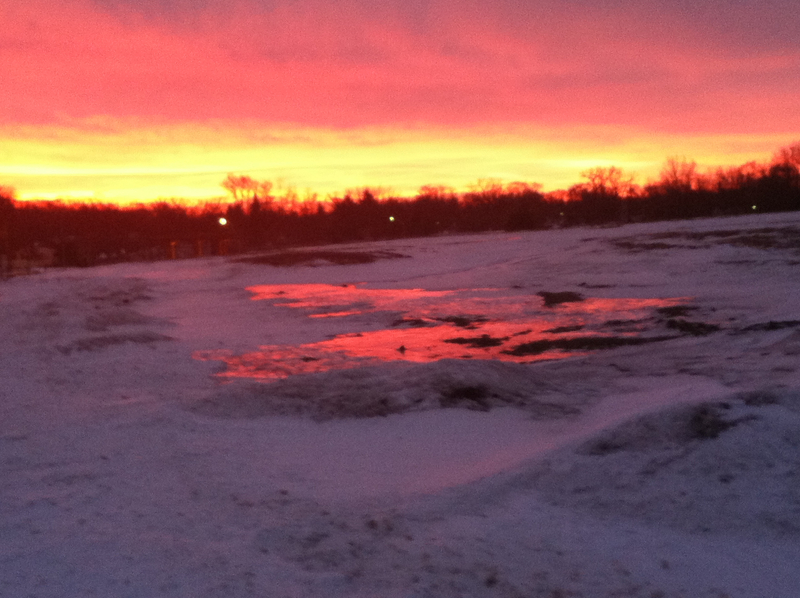 The sunrise reflected on a patch of ice in a field. Definitely a moment of awe! Much of the time, I don’t either. The consequences for my oft-times awe-less life tend to be more abstract. I have the concrete “good things”: food to feed my healthy children, a warm, snug house, enjoyable and fruitful work. A lack of awe does not always result in the gifts themselves being taken away, but we do lose some of the blessing and goodness of the gift when we do not see it as such, when we let it become commonplace, something we believe we deserve, or something less than a gift—a burden. As I write this, I am secreted in my bathroom, the one that has one door that opens into my bedroom and another that opens to the den. Patrick and his friend, Ben, are having a rock concert in my bedroom; Jake and his friend, Josh (Ben’s older brother), are in the den playing on the Wii. I can hear both sides. Much of the time I forget awe at these amazing gifts: two healthy sons with good friends, toys for them to play with when the weather is such that I can’t simply kick them outside all day, more than one bathroom (that’s HUGE! ), a warm house, and bathroom doors that LOCK! Woohoo! I am in awe at these gifts of God in this very moment, and the goodness of this moment is revealed, and I can view the chaos and noise as a blessing. It is now ten minutes later, and I am no longer in awe. How quickly I move from awe to frustration. It doesn’t even feel deliberate. I don’t remember making the choice to get frazzled: I just slid right into it. Choosing awe, on the other hand, requires, well, choice, requires acknowledgment of need and cries for help—and then requires the entire process again only moments later. Awe is clearly not my natural state! It is now three hours later—three loads of laundry finished, three loaves of bread made, children out to play in the snow then back in (with another neighbor friend in tow), the two brothers picked up by their mother, two of mine sent to a friend’s house, one quick run up to the high school to pick up Judy, who is exhausted from all-day play practice, and snacks fed to the only two young children left in my house—and they are busy with non-destructive play—Yay! Someone actually remembered to charge my laptop after they played on it during the three-hour interim, and I am sitting down to write this—because writing is how I meditate on truths God is teaching me. As much as I would like awe to be a constant state, it simply isn’t, and that really has nothing to do with the chaos of my family. If I lived in a monastery, and everyone around me had taken a vow of silence and peace, something would still cause me to slip from awe. Perhaps that is actually a good thing—not necessarily the slipping, but the struggle it pushes me into (which reveals my helplessness and ends in my crying out). The battle for awe, for joy, for peace—for God, ultimately—strengthens my desire for Him. I see the contrast between awe and “regular life” more clearly as I wrestle my way back to awe time and time again. Is this what James was suggesting? That my ongoing struggles will build endurance, that patient endurance will open my eyes to see God’s “good and perfect gifts” and see Himself as the Father of lights? Maybe? Like my struggle for awe today, all my spiritual sight is shadowed and grows clearer only in small increments.